First up was Sanders ex Wilts and Dorset Volvo HF54HGA (513) which had eluded me since its arrival, it was waiting its turn on the X55. Konectbus now run a very varied fleet indeed and one i was not expecting was this ex Carousel E200 OU57FHA, now numbered 298 with Konect and was working the 50 service to Eaton Park. Continuing with Konect a large batch of Mercedes Benz Citaros have been transferred from Go Ahead's Bluestar fleet in the Southampton Area. HF55JZD is pictured above still carrying branding of its former employer, the batch has been renumbered into the Konect fleet. Finally we see Borderbus 208 BB58BUS which has recently returned from refurbishment, this one being unique as it has retained its centre door layout from its time in London. I hope to be back in the city on New Years Eve for a proper catch up with the camera! Best Wishes for the New Year Grahame. As the year draws to a close we take a brief look back at local bus activity during the last twelve months. First Great Yarmouth witnessed the incoming and outgoing of a number of buses during the period. The positive side included two Volvo B7TL/ Geminis from First Borders which moved on to First Essex in August. In May the first of five First Manchester ALX400s began to arrive; to be followed by two ADL Pointer Darts from First Cymru in October. 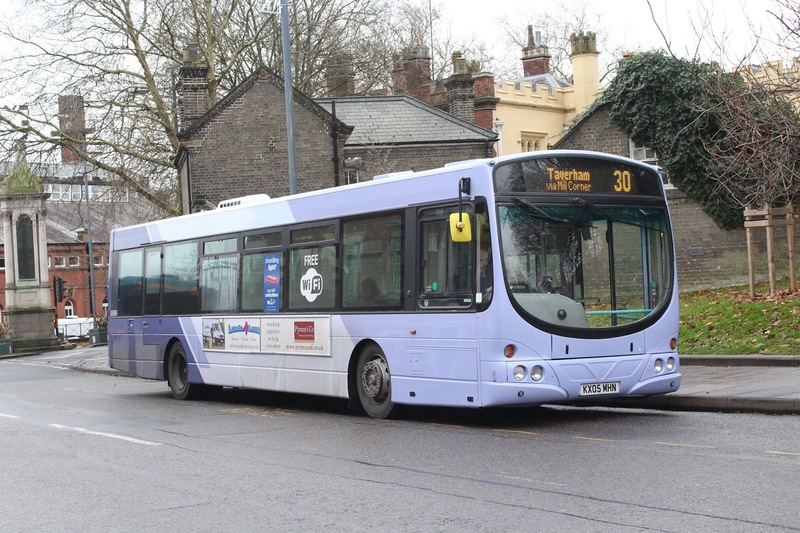 First Lowestoft received three Alexander Dennis Enviro200s from First Berkshire in February allowing the release of smaller versions to First Glasgow later that month. 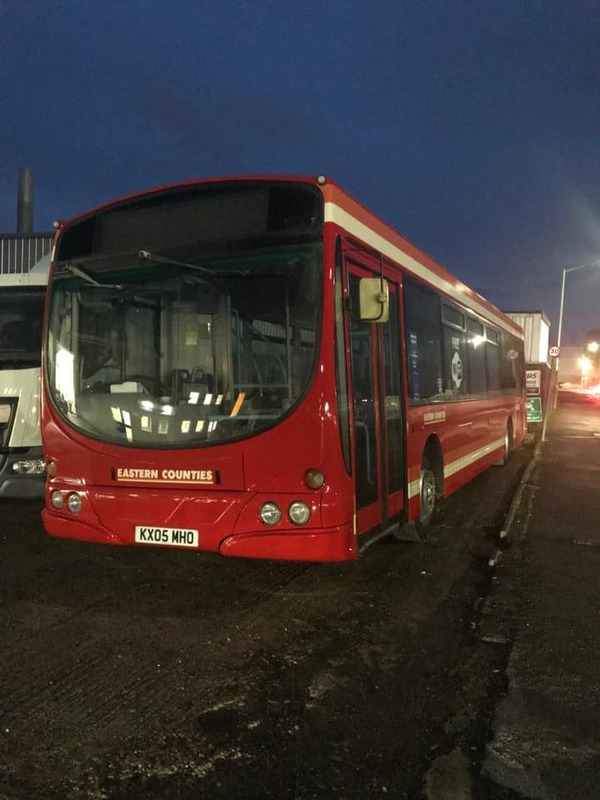 The Gasworks Road depot lost one of its Excel liveried Enviro400s to Kings Lynn to replace one lost following a fatal accident. It was temporarily covered by the loan of a Norwich Volvo B9TL then permanently by a similar bus from First Leeds. The period saw the closure of four Norfolk independents. These included Craske Coaches of Catfield in June, Caister based Reynolds Coaches in August, Richards Coaches of Guist during November and Spratts Coaches of Wreningham at the end of this month. Following the closure of Reynolds Coaches, Ambassador Travel gained a couple of schools contracts. The company were later being stretched to cover their commitments following the loss of one of their coaches in a fire whilst working a schools duty. The transfer of two Caetano Levantes at the beginning of the year couldn't have helped the situation. 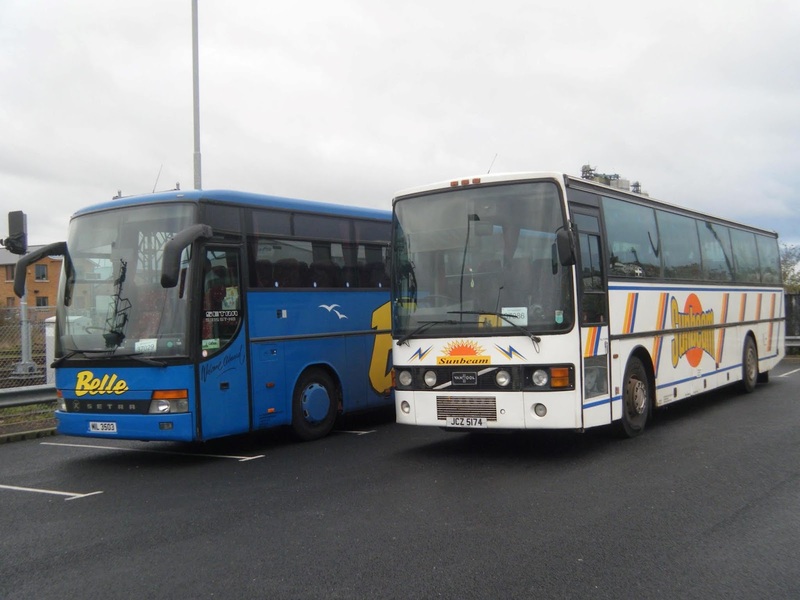 Two demonstrators were loaned to Belle Coaches during the summer in the form of a Mercedes Benz Tourismo and an Irizar i6. Another Tourismo has also joined the fleet permanently. An Alexander Dennis 200MMC demonstrator was on loan to BorderBus in March seeing use on the 146 route between Southwold and Norwich. 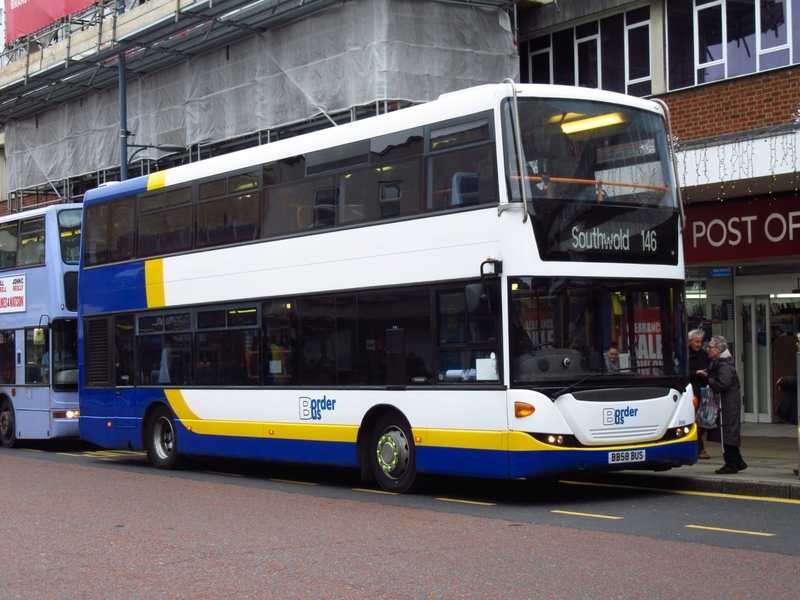 In October it acquired a fifth ex Stagecoach London Scania which it previously used for evaluation last year. Leaving the fleet was the operator's only Enviro300. Some positive news is that Rollesby based Jubilee Coaches continues to expand with more vehicles joining the fleet including a former Reynolds' Dennis Javelin. Apparently more vehicles are due to come next year! On the minus side former Anglanbus Solos were removed from service with an OmniCity decker withdrawn following a road traffic accident. 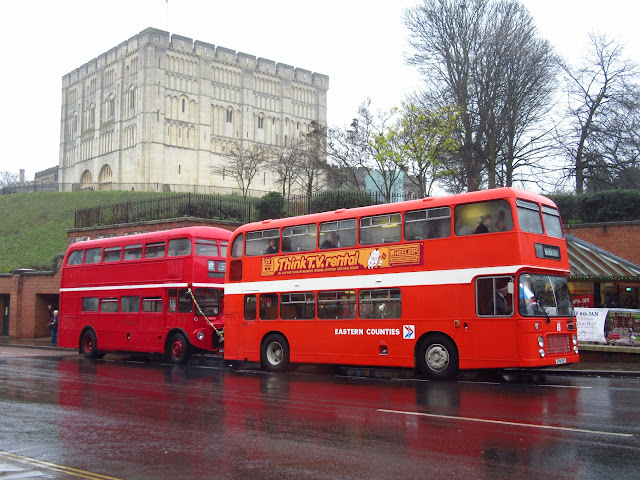 Two further similar ex Anglian deckers moved on to Hedingham whilst more Anglian saloons were withdrawn during August. 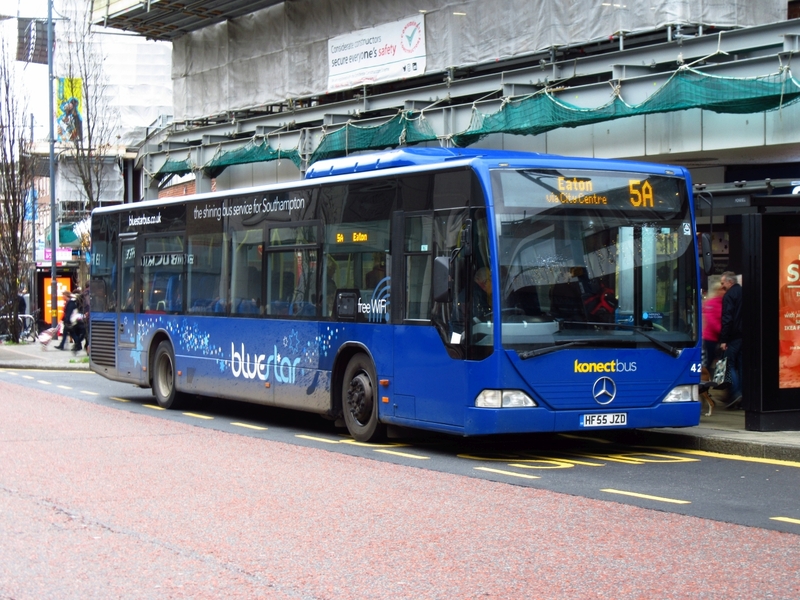 Meanwhile the Anglanbus licence was surrendered in April with services registered with Konectbus. By September the Lamberts Coaches fleet had reduced to six active vehicles with one of them being a Mercedes Benz Vario purchased from an operator in Cumbria. Our Bus acquired a blue liveried Optare Solo during November from the Manchester area. Early sightings of VOSA registrations suggests some cancellation of services by this operator in 2019. During the year, Sanders Coaches saw the arrival of two smart looking Plaxton Elite bodied Volvo B9Rs from Parks of Hamilton. More newcomers included a dozen Volvo B7RLEs for the new Coasthopper services plus some ex Lochs and Glens Volvo B13Rs to replace two Berkhof Axial bodied VDLs which left earlier in the year. 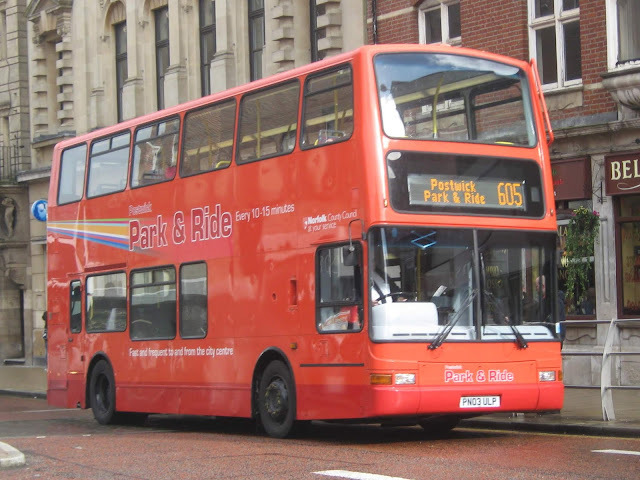 The Great Yarmouth Airshow Park and Ride services, were organised by First during June; which brought a wide variety of operators and vehicles to the area to provide the two routes from the north and south of the town. 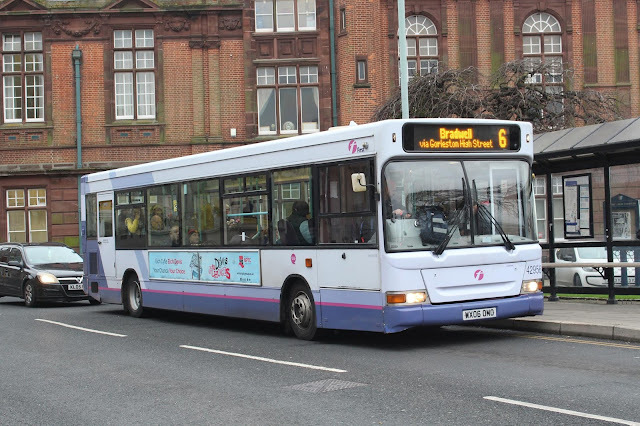 Finally the shooting of Danny Boyle's latest film in the area meant the appearance of a former Halton Transport Optare Solo in the Gorleston Beach area. That's about it from me for this year and all that remains is to wish you all a happy, healthy and prosperous New Year. After an enjoyable Christmas Day, Boxing Day was spent generally lazing around watching old films (yet again!) and a bit of reading for a change - including catching up with the latest Fleet News in Buses. Immediately the first item revealed that 2 Way Travel of Scunthorpe had acquired Volvo B12M/ Plaxton Paragon WV02EUR from First Eastern Counties. Many of you will remember it working the X1 route and it is seen here outside Caister Road Depot on 5th October 2012 having then been recently transferred from First Midlands (Worcester). In amongst the Connexions Buses of North Yorkshire update was that ex Ambassador Travel Optare Tempo YJ57EHX was in green/white livery with branding for the X1 route between Harrogate and St James' Retail Park. It is seen here, when with Ambassador, in Acle High Street on 12th November 2010 and later moved on to Norfolk Green and Stagecoach East. It was quite often to be seen in Norwich on the X29 Fakenham route. Also included, as previously recorded on the blog, was the reported sale of Hedingham Tridents T812RFG and W824NNJ to Ensign of Purfleet which subsequently went for scrap. Other former Anglian buses were withdrawn by Konectbus during August - Scania OmniLinks YN07LFU, YN07EZB and AU58AUV plus OmniCity YN05HFJ. Hope you all enjoyed your Christmas Day celebrations with plenty of food and drink to wash it all down with! The full Report will soon be available to view on the Gov.uk website - enjoy the Boxing Day sales! Finally, as this will be my last post before the big day, may I wish all readers, contributors and friends all the very best for Christmas and hope that you get everything you wished for. As reported last week, Awaydays have been operating a special free half hourly service around the city to raise money for The Big C Appeal. I was in the very damp city today for shopping purposes and managed to see the vehicles in action. 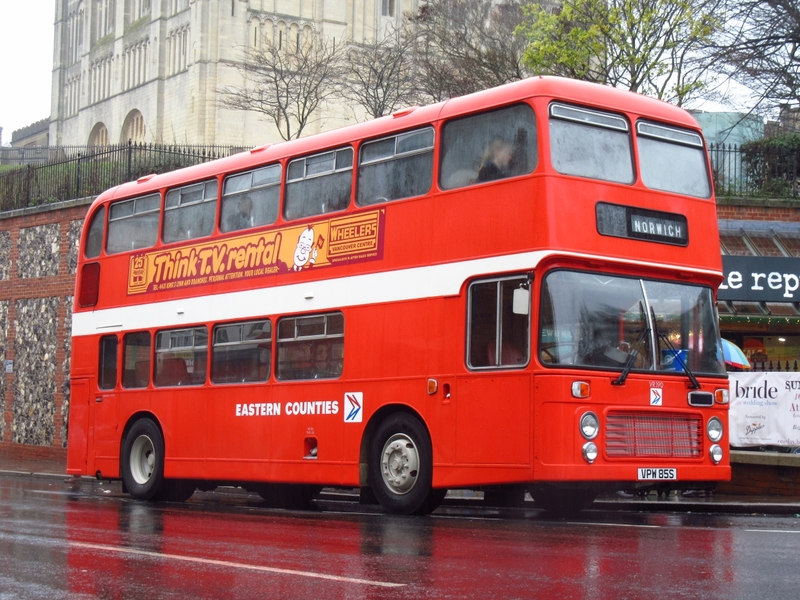 Preserved Eastern Counties Bristol VR190 VPW85S was looking splendid in the rain seen above awaiting passengers in Castle Meadow. 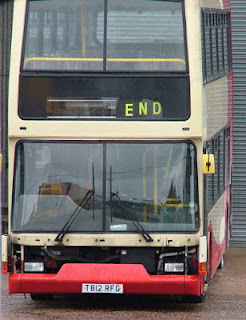 It was running alongside Routemaster CUV151C which has recently returned to use after accident repairs. I did speak to Sam Larke who was conducting this morning and a nice amount of money has been raised for the charity so far and passenger numbers were very healthy despite the awful weather today. Another Volvo has gained a full Eastern Counties make over to join its sisters 60915/6 in Norwich. 66985 KX05MHO has been transferred to Norwich along with sister 66984 from Ipswich and has been treated to the new look at Simon Morris. Many Thanks to Paul Bennett for use of his photo. Its fair to say i have not had chance to get out much with the camera recently to catch up with all the goings on for First, but thankfully we have a band of kind people who let us share their photos on the blog. Mark Doggett has been out and about in Yarmouth and Norwich. Former Essex Scania 65678 YP02ABN pictured in Castle Meadow, was on loan to FEC aswell back in 2002 when new as a Demonstrator before passing to Essex. A recent arrival in Norwich from Ipswich is Volvo B7RLE 66984 KX05MHN which has been repainted into the generic Lilac fronted livery for all Norwich routes, seen here working the 30 service out to Taverham. On to Yarmouth and a pair of ex Cymru Darts recently arrived at Caister Road, 42955 WX05OMM is seen above laying over at the depot whilst sister 42956 WX05OMO is pictured below outside the Town Hall en route to Bradwell on the 6 Service. 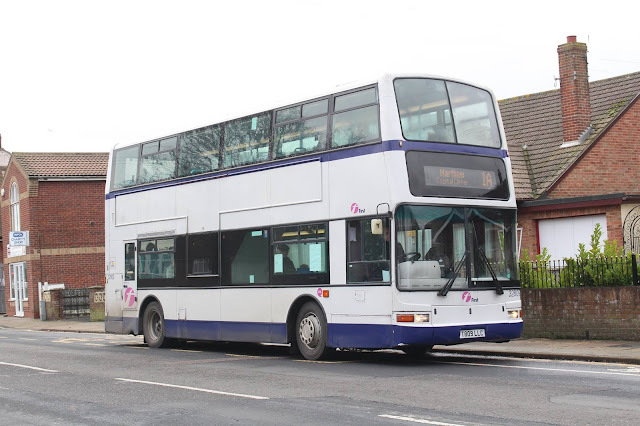 Still going strong in Yarmouth is Dennis Trident 32809 T809LLC, pictured below on Northgate Street working the 1A service out to Martham, it is a regular in daily service at the moment, not bad for a 20 year old! Flying Banana Heritage liveried Dart 42943 WA56OAS is pictured below having a rest at Caister Road. Finally another Heritage livery to report is Volvo B7RLE 66985 KX05MHO has gained the Eastern Counties Red livery similar to 32479, 42926 & 60915, it will be moving to Norwich from Ipswich shortly. Once again many thanks to Mark for use of his excellent photographs. Happy Christmas to all our readers, have a great time and stay safe! Earlier this morning, five short stayers were observed on Great Yarmouth's seafront preparing to return home with their passengers. They comprised three from National Holidays' fleet and two Shearings' coaches. Two of the former were parked in the vicinity of the Carlton Hotel in the form of Kassbohrer Setras NH14OBH and NH13GWH with the third, NH15CDH, taking up residence near the Britannia Pier. 37423 ready to depart on the delayed 9:17 to Norwich - note the new signalling system in position though not in use. On the way home I noted that the 09:17 Norwich train remained in the platform. It was made up of the short set with 37423 Spirit of the Lakes at the business end and 37405 on the other. The signal came off at just after 9:30. Just one item of interest in today's Notices & Proceedings Report prepared by the East of England Traffic Commissioner. Richard Hopkiss and Pamela Hopkiss of Sutton Road, Catfield are to amend the route and timetable of their 1A, 1B, 2, 3, 4, 5 services between North Walsham Market Place and North Walsham Sainsbury store. Trading as Feeline Executive Travel, the company are to make the changes from 21 January 2019. Some of you may have noticed I have been conspicuous by my absence! My PC finally gave up the ghost after soldiering on for a couple of weeks. It just didn't want to play on Thursday morning so I took it off to see our friends at CDS KAS at Oulton Broad. Within 48 hours they had saved my data, wiped the disk clean and reinstalled the software ready for collection on Friday afternoon. Great service and advice. Now on to main part of the post which comprises a delayed report from First Caister Road. On Thursday I was informed that work had been completed on ALX400 30886 W741DWX and was finally back on the road at Lowestoft. 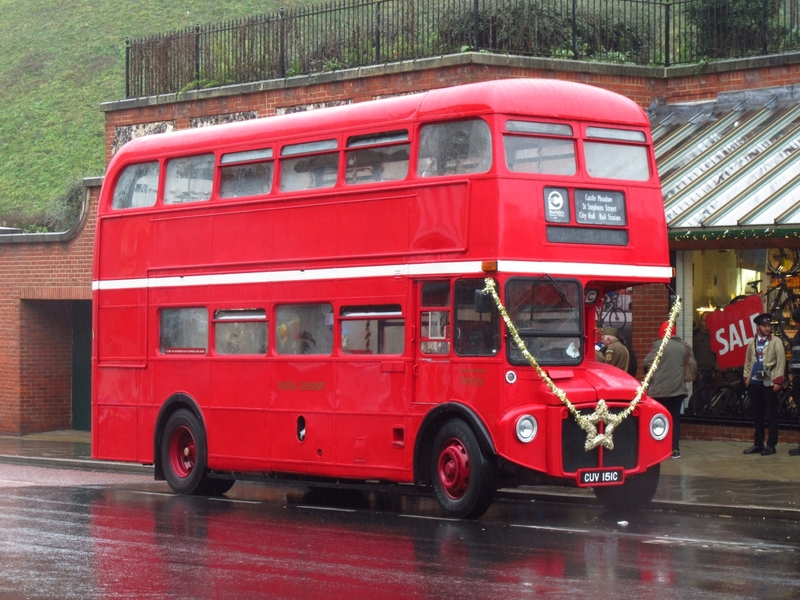 It was observed on Friday when it was seen reversing off the stand at the bus station to work the 99 to Southwold. 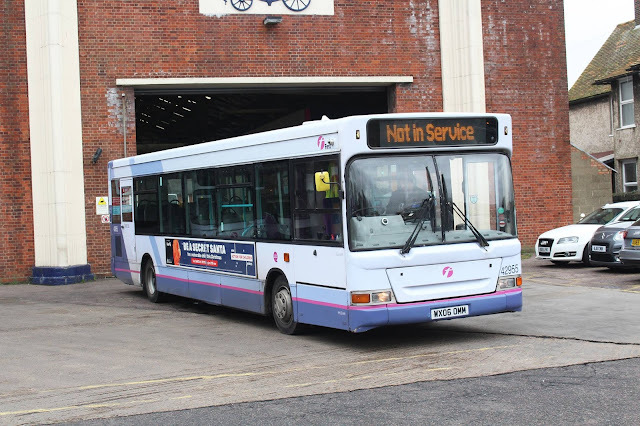 Two Great Yarmouth vehicles have also returned to use - ALX400 30959 YJ51RCO and Dart 42919 EU05AUL. Meanwhile, Scania L94UB 65673 SN51UYG was undergoing inspection. Social media users may have recently seen advertised a free bus service which is to operate around Norwich city centre next week. Awayadays, who operate a London Routemaster bus and Norwich’s City Sightseeing tours, will be providing a service free of charge in order to raise money for Big C – Norfolk and Waveney’s local cancer charity. The half-hour circular route starts at Castle Meadow, and calls at St Stephens Street, City Hall and Norwich Rail Station on its rounds. Doing the honours will be Routemaster RM2151, which has only recently returned to Norfolk following a partial rebuild after it was hit by a car on the A47 in May, causing extensive damage to the rear end of the bus. 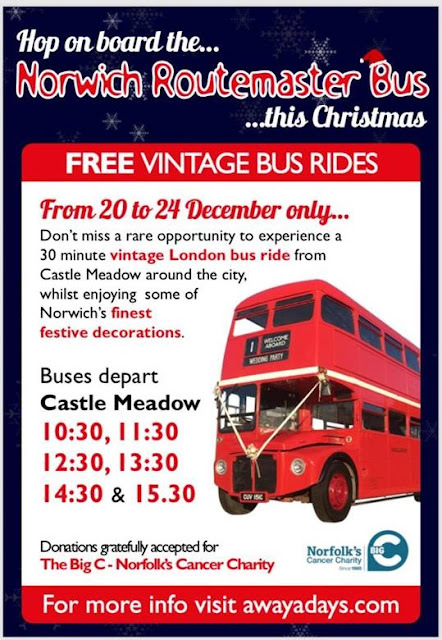 Journeys depart Castle Meadow at 10.30 and every hour until 15.30, and the bus will run daily from Thursday 20th to Monday 24th December. Donations will be gratefully accepted for the Big C charity. For blog readers, I am pleased to be able to exclusively reveal that on selected dates (to be confirmed) we will also be running privately owned former-Eastern Counties VR190 VPW85S as a relief bus. This 1977 Bristol VR has only recently been acquired by new owners, who are excited for it to carry passengers for the first time in over six years. Many thanks to Sam Larke for putting the post together and supplying all the information. Another long established Norfolk coach operator is to close at the end of the year. Spratts Coaches of Wreningham is to cease operating at the end of December with all current 11 coaches expecting to be sold. This is the third Norfolk operator to go in the last six months following the closure of Richard's Coaches of Guist in November and Reynolds Coaches during August this year. Whilst I had heard that Richard's had closed, I could find no official confirmation and I also understood that Spratts might continue until the end of the school year - obviously that decision has been brought forward. The company was established in the late 1950s by the late Colin Spratt who originally began as a taxi operator. 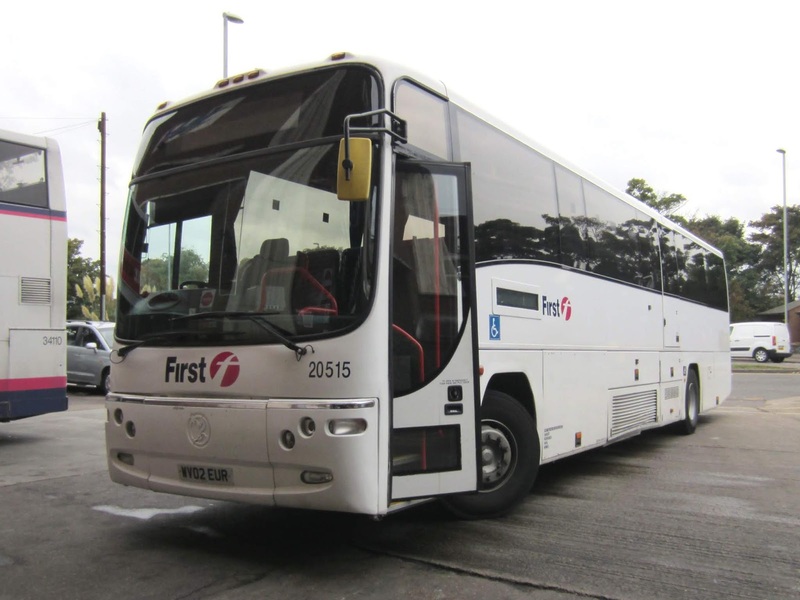 At one time the fleet totalled some 30 vehicles and was one of the first privately owned coach companies in the county to adapt a coach to take disabled passengers. The current owner has decided to retire and there was nobody in the family wanting to take over the business. All existing staff have found jobs elsewhere with three local companies agreeing to take on Spratts' existing work commitments. Whilst on my way to the local Tesco this morning, two Jubilee Coaches were awaiting their passengers from Lynn Grove Academy to join them on an outing. MAN/ Neoplan L555JCR was the first to arrive at Beccles Road with Dennis Javelin / Plaxton L333JCR joining shortly after. This morning's East of England Traffic Commissioner's Notices & Proceedings Report contains a couple of items of interest. The former Transport Manager of Reynolds Coaches, Jeffrey John Buckle, has submitted an application to use the same Ormesby Road premises for the use of five vehicles. 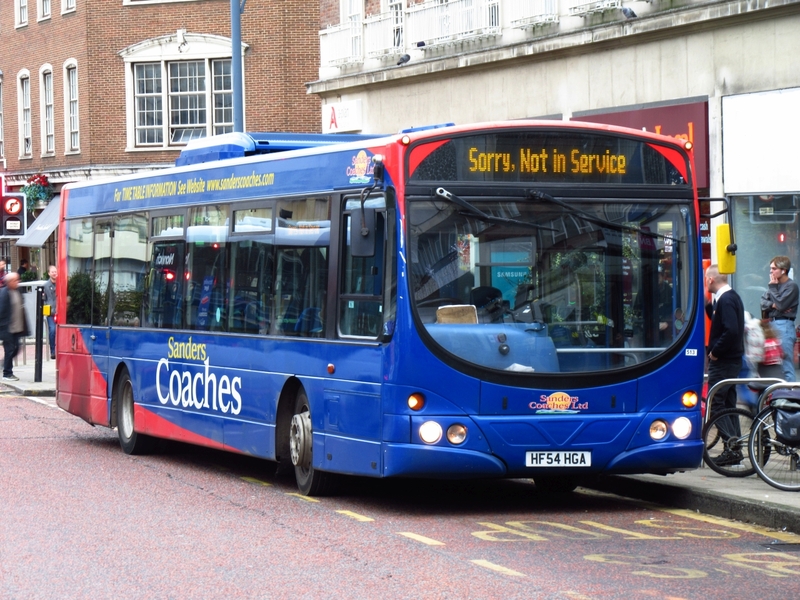 Carlton Colville based Britannia Bus has registered a new X89 Northampton to Towcester service commencing on 7th January 2019. 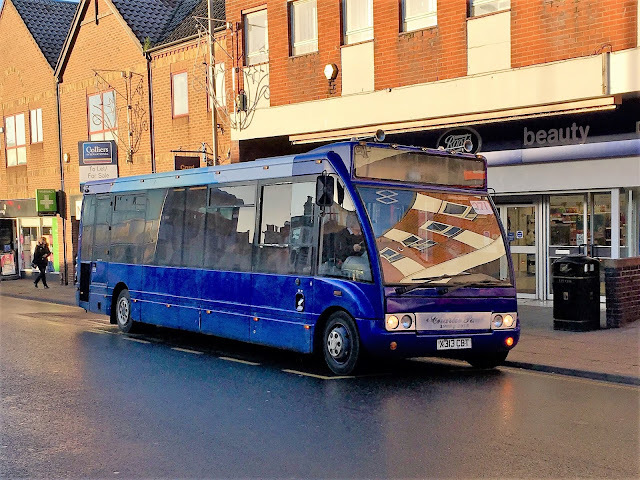 Noted yesterday whilst out and about for work was another Optare Solo addition to the growing fleet of Our Bus, South Burlingham. X313CBT has been aquired from Goodwins of Manchester, it is an M920/B33F Model and was new to Durham County Council as a 17 seater. It carried cherished registration WEZ9165 whilst with Goodwins also. Been a while since we dipped into the photo collection, so i decided to go deep this time and found some shots taken in the very early days of the Digital camera. I visited Kings Lynn on a very cold and damp January in 2003 and returned with a very mixed bag of photos. First up is Wright Urban Ranger bodied Mercedes OH1416 N133GRF which was on loan to Norfolk Green from Choice Travel, Willenhall, seen above operating the 505 service to Spalding. 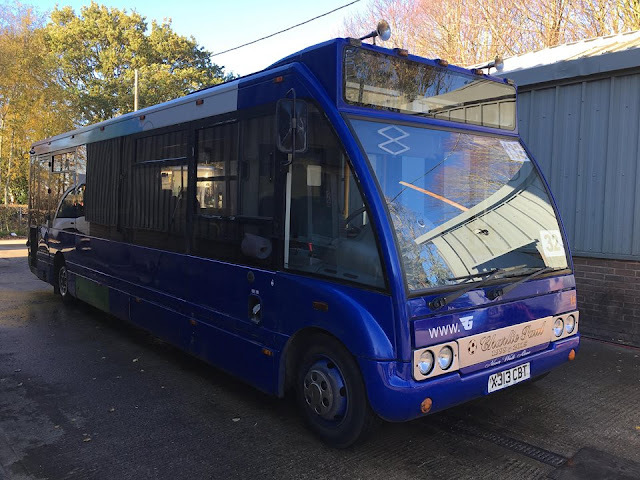 Next up is another loanee at the time, Optare Solo MW52PZC which came from Mistral Rentals, it was working the X98 service to Cromer and Sheringham. A new arrival with Eastern Counties was 502 N412ENW one of a pair of Scania L113CRL that came from First West Yorkshire, they only had a short stay with FEC before moving on within the group. Eagle eyed readers may recognise the next vehicle above, it is former Flying Banana Mercedes P681HND which had moved up the A47 to Kings Lynn from Great Yarmouth, it carried fleet number 868 and was treated to the Barbie 2 livery prior to its move. Finally another classic Norfolk Green vehicle, TIL1178 was a Leyland Tiger new to Burtons of Brixham as F279HOD, it stayed with Norfolk Green until 2006 before being purchased by Emblings of Guyhirn where it was refurbished and made and appearance at Showbus in 2007. Firstly my apologies for the incorrect information published under this header yesterday. I incorrectly assumed the term referred to the double deckers but I was wrong as it referred to the single deckers! 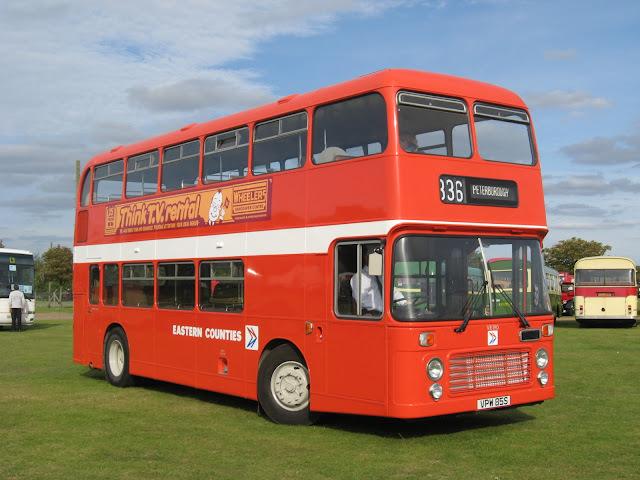 There may, however, still be a shake down of some of the double deckers with requirements reducing due to the slow down in Bernard Matthews contract work. So. to put the record straight, the days for the three Volvo B7L's at Caister Road are numbered and it is initially believed that 66334 MV02VBZ will hang on a little longer with 66341 MV02VCT and 66344 MV02VCX soon leaving the local fleet. The trio were transferred in from Norwich during January 2015. 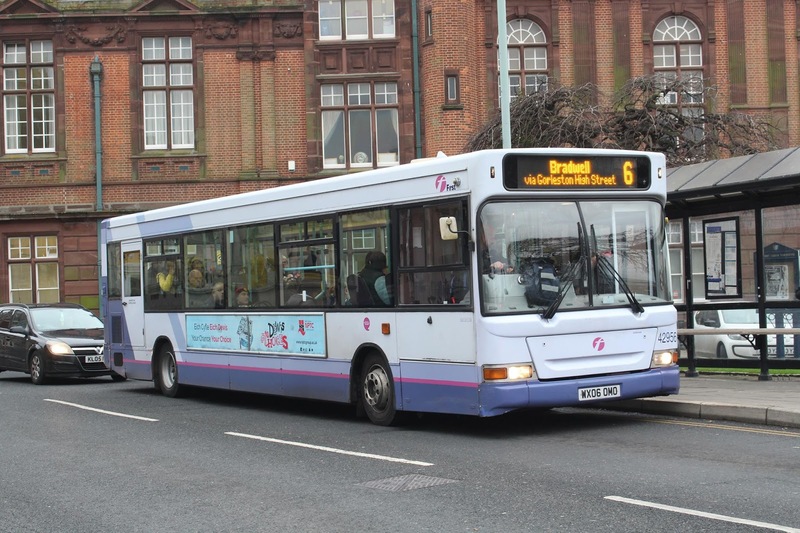 The two 06 plated Darts from Wales were initially sent to replace them but both went on loan elsewhere but have now returned and are being observed on Great Yarmouth routes. Similar Barbie liveried B7Ls should also leave the Norwich fleet around Christmas time. Again apologies for the misleading information and for any embarrassment caused to my contact at First who gave me the correct information which I misinterpreted! 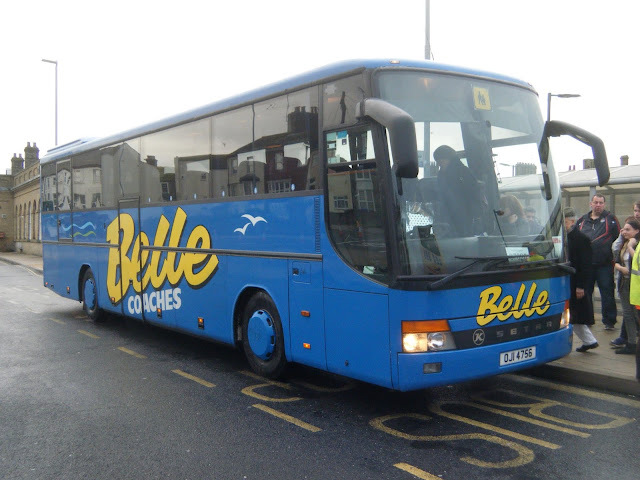 A wet and gloomy day in Great Yarmouth with four coaches observed this morning in the vicinity of the Sea Life Centre on the town's Marine Parade. This morning's East of England Traffic Commissioner's Notices & Proceedings Report again contains some changes by First Eastern Counties and Konectbus. 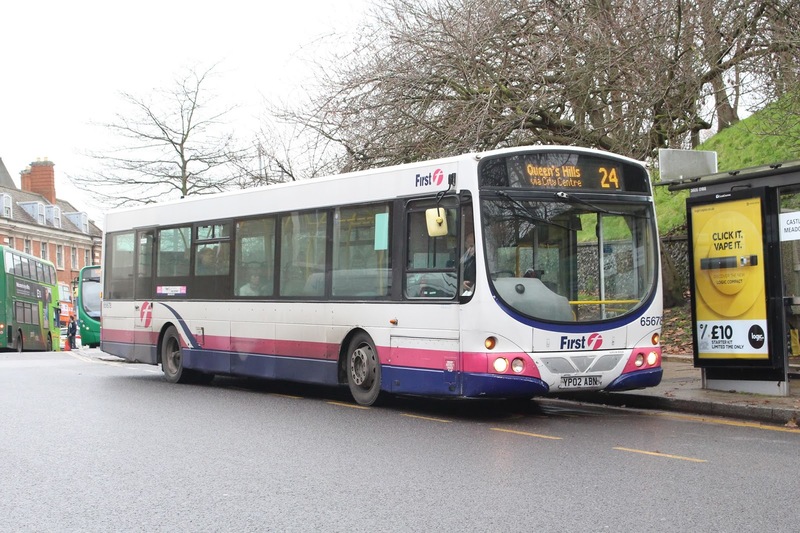 First is also changing the timetable of its 11/12 route between the Norfolk & Norwich Hospital and Sprowston/Wroxham from the same date; when there will also be timetable alterations on the 28/29/X29 from Norwich St Stephen's Street to Fakenham Oak Street. Where Are They Now ~ T812RFG? T812RFG was an East Lancs Lolyne bodied Dennis Trident which was new to Brighton & Hove in May 1999. It was received by Anglianbus in 2012 still in Brighton colours as Tim Miller's photo shows but subsequently repainted at Beccles based Car & Commercials in August that year. 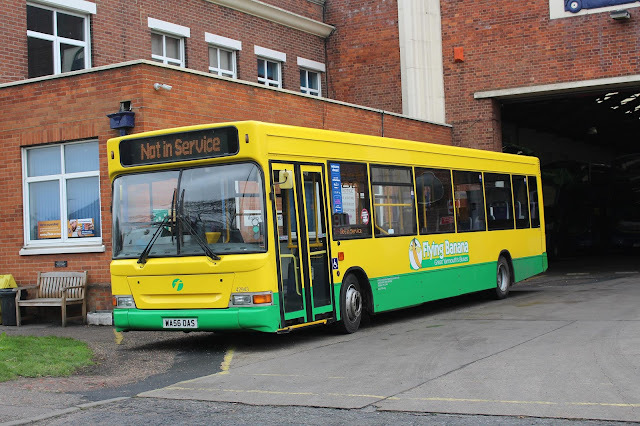 Its last stint with Anglianbus was in 2016 when it moved to Beccles during February that year. 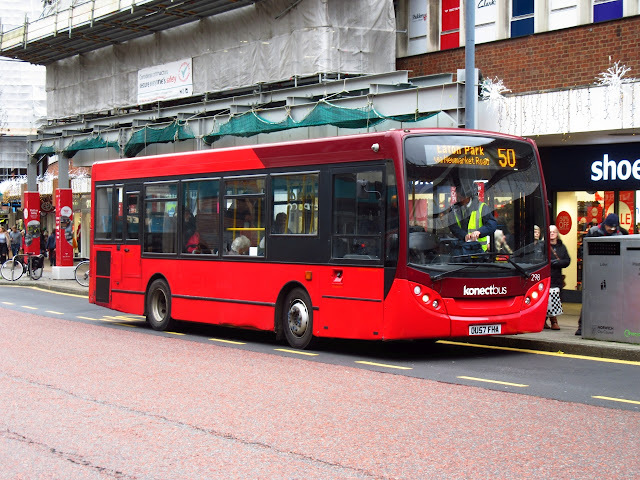 It was withdrawn in August of the same year, only to return to service in October following the transfer of the gas buses to Plymouth Citybus. A month later T812RFG was transferred to another Go Ahead subsidiary, Hedingham & District who operated it primarily from their Clacton depot. Robert Appleton sent a photo of it operating in Essex, still in Anglian livery, in July this year - see Ex Anglian Deckers in Exile - 21st July 2018. However, Ross Newman's monthly Ensign Happenings report states that both T812RFG and similar ex Konectbus W824NNJ had arrived at Ensign from Hedingham during November. They didn't stay very long before being disposed of to MC Tractors of Ramsey, Huntingdon for scrap later in the month. 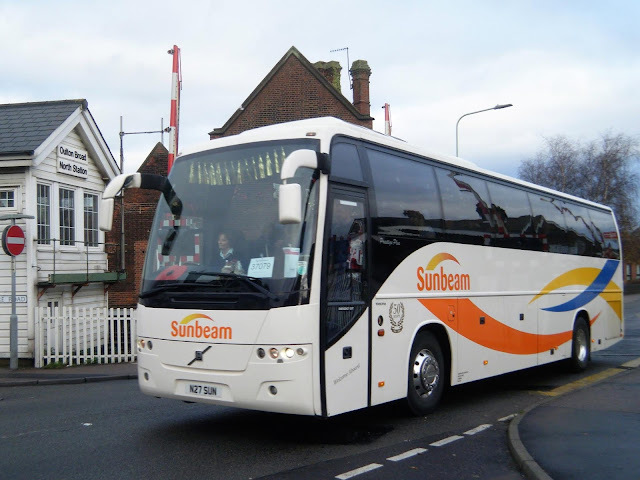 Also in use was Sunbeam Coaches Volvo M27SUN which was captured passing Oulton Broad North signalbox around 10 am with a service to Norwich. On standby at Lowestoft was Sunbeam's Volvo B10M / VanHool Alizee JCZ5174 and another Belle Coaches' Kassbohrer Setra in the shape of 37 MIL3503. Behind was Marett's Chariots Volvo B12M MX03ACZ on standby. It was formerly with Shearings. In a better photo position was Wrights Coaches Berkhof Axial bodied Scania K114 R25PTS; originally with Craskes of Catfield and previously registered YN06NZV.